Library Who is on the Nickel? Have you ever picked up a Nickel and stopped to think, “Who is the man on the Nickel?” Many people who use Nickels every day have no idea that the face on the obverse of the Nickel since 1938 belongs to Thomas Jefferson, the third president of the United States and a Founding Father who is considered to be the primary author of the Declaration of Independence. So, who really was Thomas Jefferson? Born on April 13, 1743 in Shadwell, Virginia, Jefferson came from a distinguished family. His father was a planter and surveyor, and his mother was a socialite. Jefferson inherited land from his father and would build Monticello, his home, which is also the building that you see on the back of most Jefferson Nickels. Jefferson attended the College of William and Mary in Virginia and would eventually lead an illustrious career in law and public service. He would become a member of the Continental Congress and in 1776 drafted the Declaration of Independence, our nation’s founding document. Jefferson left Congress in 1776, and returned to Virginia to serve in the state legislature. He was elected governor and served in that role from 1779 through 1781. During the following few years, Jefferson would serve as a trade commissioner in France and succeeded Benjamin Franklin as minister. Jefferson also embraced the European culture, sending books, seeds, scientific instruments, statues, drawings, and other mementos back to Virginia. In 1790, Jefferson became Secretary of State under President George Washington. During this time, Jefferson mounted opposition against Alexander Hamilton’s pro-British policies, and in 1796 ran for president as a Democratic Republican. Losing by three electoral votes, Jefferson became vice president under John Adams, the man he would defeat in the 1800 election. During Jefferson’s presidency, he would spearhead the Louisiana Purchase in 1803 and support the subsequent Lewis and Clark Expedition (which was commemorated on the Nickel during 2004 and 2005). He also remained neutral during conflicts between the British and the French that led to our going to war against Great Britain in 1812. James Madison succeeded Jefferson as president in 1809, and our third president would return to his beloved Monticello. Jefferson would remain there for the last 17 years of his life, during which he founded the University of Virginia at the age of 76. On July 4, 1826 – the 50th anniversary of the Declaration of Independence – Jefferson passed away only hours after the death of his good friend John Adams. The Jefferson Nickel, designed by Felix Schlag, is an excellent coin to collect for numismatists of all types. Jefferson Nickels are readily available in circulation, and many dates from the 1930s, 1940s, and 1950s still appear in circulation. There are only a few scarce dates among the regular-issue coins, with the 1939-D and 1950-D being the most notable of those. Those two coins, however, can be bought for under $25 each. The silver Wartime Nickels of 1942, 1943, 1944, and 1945 are easily distinguished by the large “P,” “D,” and “S” mintmarks over the dome of Monticello. These coins can occasionally still be found in circulation, though are much more easily found sitting in a coin dealer’s case. Proof examples from the earlier years of the series can run from about $5 for a piece from the late 1950s to over $150 for a specimen from the first few years of the run. Later proof Jefferson Nickels are easy to find and quite affordable. Because most Jefferson Nickels are inexpensive and are available in large quantities, many coin collectors will simply collect the entire series by date and mintmark, including proofs from at least the 1970s onward. Some coin collectors with a little extra money to spend will make the challenge of completing a Jefferson Nickel collection harder by only seeking uncirculated and proof coinage. Those on a more limited budget will seek circulated coins from circulation and coin dealers’ bargain boxes. No matter what method of collecting you prefer, a Jefferson Nickel collection would make a fine addition to any collection of United States collectible coins. 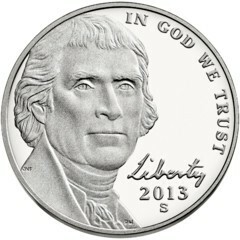 For year-by-year details on the Jefferson Nickel, please visit our Jefferson Nickel Series page.